Birmingham’s Sunshine Frisbee Laserbeam have just released their new album Blackout Cowboy with a message of caring about and listening to your friends. Fighting Boredom have had the band on our radar since we started out, read what we thought below. This is around the sixth time I’ve started this review. I get that with some records, they mean a lot to me and so I can’t just rattle something off the cuff. Sunshine Frisbee Laserbeam have been a constant in my record collection and gig diary since the first time I saw them supporting someone I really can’t remember at the Hare and Hounds way back when. If you have been to see a guitar orientated band in the Kings Heath Pub then you have probably seen them, they have been playing and releasing music steadily with great enthusiasm for a good while now. I have never seen them play the same set twice and I have always been blown away by their music and sheer exuberance. Their records are always good, the last, Sink Or Swim/Mirage, released half on picture disc vinyl and half on CD, was a massive monster collection of vital music. 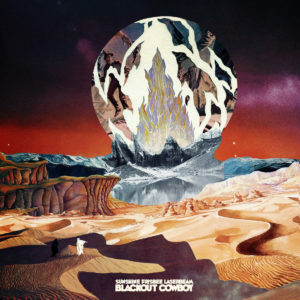 Blackout Cowboy distills everything that that they have released before and pours it unsteadily into a new cocktail of brilliance. This album is the bunch of kids you grew up with, it’s the gang of friends that you know so well that you don’t need to speak. It’s about fear of the past, the influences and events that what you are. There’s songs about those first relationships and the fear of that first kiss. The way that getting wasted happens but isn’t all that good in the end. About history, shared and otherwise. About regrets, hopes and loud laughter. But behind all that is the sheer rush of music, the feeling of youth, of knowing you are invincible, at least to a point. That is never illustrated better than in the title song. You need your friends, people need to care about each other and youth can be the best thing in the world but sometimes you need people to say that they care oh so bloody much and that they are here. They’ll pick you up and they’ll hold your hair away from your mouth as you throw up. It’s the sound of reckless joyful abandon with the lyrics of wise youth. Sunshine Frisbee Laserbeam have made the album that they’ve been threatening to since I first saw them. The guitars still soar, fuzz and crash, the drums and bass still hold it all down and the vocals switch around depending on the tune, but they have taken a leap of faith and it’s paid off handsomely. Blackout Cowboy means a lot to me, it’s just glorious, have a listen and see if you agree. You can order the album from By The Time It Gets Dark’s Bandcamp page and you can listen to their past releases on the band’s own Bandcamp page.